1Pcs or as your request. 1). Key Processing: For this EDM spare part, there are two key processes, precision grinding and precision EDM processing. they can be finished very well, and we can achieve 0.001mm grinding accuracy and 0.002 mm EDM accuracy. 2). 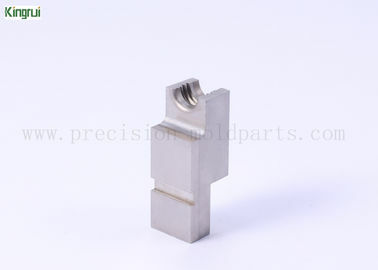 About Material: HPM31 is used for this EDM mould part. In fact, we can supply material as your demand, as long as you request, we will try our best to provide for you. HPM31 for this EDM Spare Part. EDM Accuracy: 0.002 mm; grinding accuracy: 0. 1.The defective products rate is 0.1%. Imported material 100%. 4. Skilled and experienced staff. 2.5 D projector, Digital Micrometers, all kinds of gages. electric appliance and other industries. Customization is a very comprehensive concept in our company. We follow your wishes in materials, processing, delivery, packing, transportation, etc. If you don't know your needs yet, we can also give you some reasonable advice for aspect above, or we can discuss together. The custom is not only on the processor ability test, the more important is that we want to better meet the needs of our customers. Packed with PE film, plastic box, carton and wooden box, or as per customers' requirements.